I have always found the southern highlands an interesting region of the moon to examine along the terminator. At the times of low sun the craters here take on more unique and individual identities than at higher illumination. 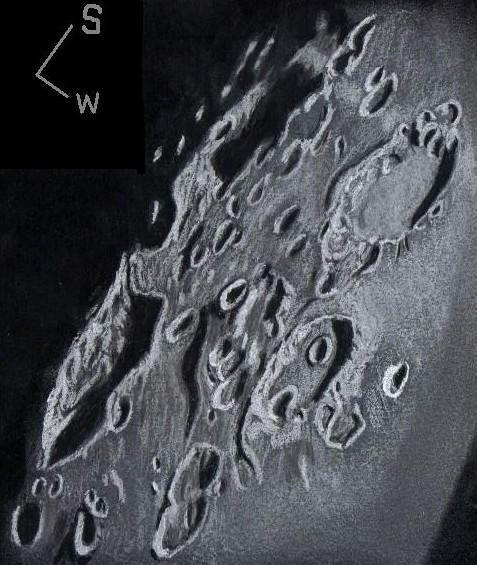 On this observing and sketching night, I managed to examine and sketch five notable craters. From south to north along the terminator are Boguslawsky (98km. ), crater Boussingault E ( 98km.) and Boussingault B (54km.). All over the southern highlands are numerous, ancient, worn, soft looking craters between 10 and 90 kilometers in diameter. Some of the craters in this region pre-date the formation of the major lunar basins. These craters look soft and dusty with smooth terraces and regolith slumping to the crater floors. Lunar geologist Donald Wilhelms speculated that the appearance of the craters here is caused mostly by fluidized ejecta and debris tumbling down the crater walls to the floor. He also believes that the craters in the region of the sketch are sitting on an ancient 650 kilometer basin that is all but destroyed save for pieces of rim here and there. The two craters further west from the terminator from south to north are Manzinus (98 km.) and Mutus (78 km.). Craters B and A, both about 16 km. in size, can be seen on the floor of Mutus. As a target the moon proved to be a very enjoyable subject on this evening of observation and sketching. For this sketch I used: black Strathmore 400 Artagain paper 10”x 8.5”, white and black Conte’ pastel pencils and a blending stump. After scanning, Brightness was decreased (-2) and contrast increased (+2) using Microsoft Office Picture Manager.